Quad Softtech is a Surat based Website Development and Web Hosting with Domain Registration company. Internet is unimaginably huge metaspace. Domain is like your own private territory within this metaspace and domain name is the identity of your territory. Defining technically domain name is a unique alphanumeric name used to identify a particular computer, a web server or a mail server on the internet. Quad Softtech offers Domain Name Registration Service as part of Web Design, Web Development and Web Hosting packages. However it need not necessarily be part of these packages. We also carry it out as independent service. 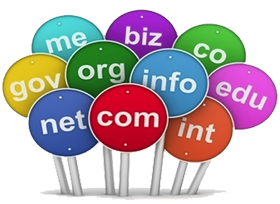 We understand it is important to choose the right kind of domain name for business. We take care that your domain name is selected in such a manner that it reflects your company and encourages trust and professionalism. We offer qualified advice on how best to choose a domain that will benefit your business to the greatest extent. You can register any kind of domain name with extension such as .com, .net, .org, .biz, .info etc. Domain Name Registration, i.e. a particular domain name gets reserved in your name. Web Domain Admin tool to modify your records. Domain names may be up to 63 characters (including the suffix). Confirmation regarding registering of Domain Names in your name will take 2-3 days from the date on which we receive the payment from you. Internationally, Domain Name registration is on a First-Come-First-Serve Basis. We will not be responsible for the availability of the Domain Name in the 2-3 days that it can take to register a Domain Name. We will not be reponsible in any if the domain is registered by some other person/organization in between the time we receive your email request and by the time the payment is made. Any entity is it Individuals, organizations, ISPs, Corporate Resellers, etc. In any type of profession can register to get a recognition on the internet. You can register a domain name from 1 year to 10 years depending upon your budget and requirement.